Chicago-based firm Studio Gang has revealed plans to add a series of glazed pavilions with pleated roofs to an arts centre in Arkansas, as part of a major renovation and extension project. Studio Gang's scheme includes 127,000 square feet (11,798 square metres) of new and refurbished spaces at the Arkansas Art Center, which comprises exhibition, education and performance facilities in the US state's capital Little Rock. The building is currently made up of eight different structures that were added over a period of time to the city's Museum of Fine Arts, built in 1937. The centre's executive director Todd Herman describes the complex as "a very complicated puzzle". Studio Gang's aim is to offer a more coherent layout, as well as provide additional space for the centre's expansive public arts programme of classes, lectures and film showings. Among the main features of the project is the introduction of a new axis, which will cut through the centre of the building. It will lead from the northern entrance facing Crescent Drive to the 36-acre (14.5-hectare) MacArthur Park on the southern side, connecting to the different programmes along the way. Part of the existing structure will be removed in order to include this new pathway, revealing the old brickwork entrance of the existing Museum of Fine Arts. It will also create a public square in front. "Starting from the inside out, the design clarifies the organisation of the building and extends its presence into MacArthur Park and out to Crescent Lawn," said Studio Gang founder Jeanne Gang. "By doing so, the centre becomes a vibrant place for social interaction, education, and appreciation for the arts." Inside the addition, the wooden underside of the faceted roofscape and the curved supporting columns will be left exposed. Large expanses of glazing will offer views to the surroundings and provide plenty of natural light, forming part of the scheme's sustainable design ethos. Other eco-friendly features will include rainwater collection. Double-height blocks will create a second floor for galleries, while more new facilities will include additional art studios, an art school gallery, and a drawing research centre and conservation lab. There will also be a Cultural Living Room, which will adapt to range of activities; a black-box theatre, which is an undecorated performance space; new classrooms and a family art adventure space. Set to break ground in 2019 and complete in 2022, Studio Gang's project will be accompanied by landscape architect Kate Orff's proposal for the surrounding site. Orff plans to plant over 250 new trees, and create new pathways and trails that link with the park. 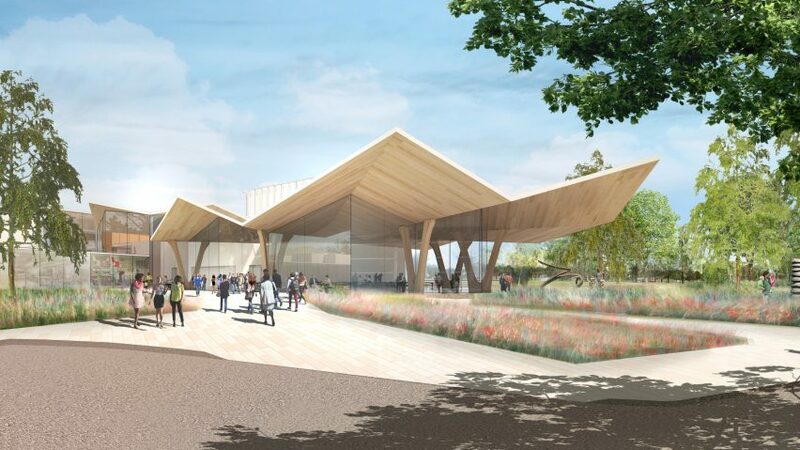 "The site design will rejuvenate and expand the connection between the AAC to MacArthur Park, welcome and orient the Little Rock community to the grounds and weave native regional landscape forms into the existing park," said Orff. Studio Gang was awarded the Arkansas Art Center commission above five other firms who had proposed designs. The architecture studio's previous cultural projects include a Chicago performing arts centre, and a geological-inspired addition to the Natural History museum in New York that received approval from the city's Landmarks Preservation Commission in 2016.